benebalm conditions & hydrates with mango butter and sodium hyaluronate. This kiss of sheer color gives you the sexiest lips. Whether single or bound by the dozen, roses always do the pretty trick. Swoon for petal-soft lips that pucker with classic beauty. Just the tint for long walks on the beach and getting caught in the rain. Glide on bare lips or over your favorite tint. Muah! Sister act! Wear benetint & benebalm for kissable color that lasts. This product smells as beautiful as the Benetint product and provides a natural, rosy tint to the lips with lots of hydration. Together with the Benetint, it provides a deeper red to the lips that looks so beautiful alone or with face makeup. Great product. good lipstick, hydrating enough to give you smooth and soft lips whenever you wear it, not dry it out all throughout the day. This lip balm is perfect for my lips. Love this product. I love a texture and how I feel it on my lips. Goes really well won't the roses lip tint, lush scent. Definitely recommend!! BeneBalm has a beautiful finish, especially with BeneTint! It's colour is suttle but that understandable as it is a lip balm, and it is very hydrating! Also, the packaging is gourgeous! The only thing I would say is that it doesn't stay put on you lips for very long. Overall, a brilliant product! This hydrating tinted balm works perfectly for me - love the color, smell and texture! A perfect sheer balm. I can use it all year round, even during cold Minnesota winters when my lips are dry. It smells absolutely amazing, and I love the color. My only complaint is that it does not last as long as I wish it did, so I have to apply it multiple times. May have to try it with Benetint. This is such a great product! I love how it sits on the lips, I like the formulation and I really love how long wearing Benebalm is. Dont leave it in your car! I LOVE THIS LIP BALM!! It is by far the best I have ever had, I love the way it feels and smells and the tint is amazing!! Just 3 things kill me about it!! 1) Wish it had a nice "flavor". I cant help but prefer lipsmackers just because they have a nicer taste. With Benebalm your lips are soooo kissably beautiful but its yucky when you do!. 2) Wish it was cheaper! and honestly the only reason why is for #3 3)DO NOT LEAVE THIS IN YOUR CAR ON A SUMMER DAY!!! I had 2 lip balms on 2 different occasions stay in my car they they COMPLETELY MELTED!! So much that there was not even a hint of any lip balm in the container! like it evaporated!! I was SOOO bumbed. I left it in my car for just quick application thinking no problem but I was soo wrong. Other than that though I would recommend getting a few because you will love it that much. I got this on a whim since I adore lightly colored lipsticks with my paleness. It is fantastic! It makes my lips so smooth, so quickly! And it looks great alone or over my benetint. I even bought one for my sister! It's that good. Also, as we have both noted, it has a pleasant scent and a subtle taste on the lips. Benebalm truly is a hydrating tinted balm. I love the color payoff, the way it feels on my lips, and the rose scent. HOWEVER, the product sort of melts in its case when you're in a warm place. Because of that, it applies watery the next time you use it. It dries up again, but then you'll realize that that cycle tends to make the product finish faster. It also doesn't have much product in it to begin with. It's good but I won't be repurchasing. I'll stick with Benetint instead. Just impulse-bought this today (the super cute packaging caught my eye) and I can tell I will by buying another tube as soon as I run out! It has great texture. Feels like a chapstick, which I prefer because most tinted lip balms still feel like lipgloss. Has great shine. But ever after wearing it for about 5 hours, after eating and no re-applying, the shine and moisture were gone but my lips were still stained a rosy red! I'm not one for wearying lipgloss or lipstick, but i still appreciate a little color. This is fantastic! I really like how moisturizing this tinted lip balm is. It has a nice rose scent that is light. It imparts a sheer red tint to your lips that is flattering. It is very hydrating and has kept my lips smooth. I carry it in my purse but will definitely be buying another one to keep at home. I love Benebalm and purchased it in the launch. The only reason it's one heart off is because the more you apply on a daily basis, the less you have to use for the next week. I've used Benebalm a couple of times with only one layer is enough for my lips but as I wind up the product, there's less and less. It's twice as expensive to purchase at the counter than online but the amount of product you get is great but not so great. Doesn't last for months, only weeks. I would've given a 5 heart rating if there was more product in to use instead of finishing in less than a month. Besides loving the rose scent (my favorite flower) the color is just enough, not too dark or too light. I've always struggled with normal lipsticks then I discovered this. Amazing and gorgeous. This is hands down the best lip balm EVA! It is creamy and smooth, not greasy at all! It is a beautiful rose color and even fades (after a good while) to a pretty sheer red tint. It looks totally natural, like you were just born with perfectly flushed lips! I will buy this forever!! P.S. It totally smells like fresh cut roses! C'est tres magnifique! I am so fussy with lip colours and have never found the right lipstick for me. I just want something that highlights my lips with a subtle flush of colour but looks barely there. A couple of days ago I impulse bought BeneTint and BeneBalm. So glad I did. It does exactly what I want. BeneTint gives my lips a flush of subtle, long lasting colour and BeneBalm makes them look and feel soft and kissable. The BeneBalm can be built up and has quite a sheen to it (but no the wet look of gloss), which I love. The packaging of BeneBalm is also worth a mention - its gorgeous! Shiny and looks really expensive! I happen to love all of the benefit cosmetics I've tried up until this point. I ordered the benebalm because I love lightly tinted lips. However, benebalm provides absolutely no color, making it a very pricy clear lip balm. I've even tried using the benetint with the balm which helps darken lips a bit giving you color, but again, the same can be achieved using the tint with a much less expensive clear overcoat. Unfortunately, this is one product I won't be recommending or purchasing again. I was, and still am, sorry to have seen the previous Benetint Lipbalm go for good, it had been an inseparable companion for me and a must in my bag, something I went to whenever my lips needed some moisturizing. Not only was the slight very appealing and a very good complement for the tint, but the jar containing it was also very attractive. However, I very much like your idea of launching lip balms for each one of your tints and intend to get the four of them. So far, the balm replicas for Benetint and Lollitint are the first ones that I bought. Now, for Benetint Lip Balm: -I quite like the design. And I also think it's quite practical. It´s more direct and quicker to have the stick than having to dip the finger in a jar to get the product. -Perhaps I would have liked a little more colour, but the shade it has is very much to my liking. -It´s an excellent complement for the tint, but solo looks lovely. And, why not?, it can even be worn on top of other tints. The day I bought this one, which was the day I got it tried on in the Benefit stand, I wore it over the mixture of Posie Tint and Chacha Tint (a mixture, incidentally, which I've tried on now and then and has never failed to please me) and it looked great. I like the product very much, I don't think it´ll take me too long to get the other balms. And, like its predecessor, it´ll be an inseparable companion. Lovely feel, amazingly long lasting, gorgeous rosey scent and beautiful colour! I adore this product! Firstly it is a great lip balm, very hydrating and it makes my lips super soft. It is also really long lasting, you don't need to constantly re-apply. Secondly the colour is beautiful, it can be subtle if you just swipe it on or you can put on a couple of coats and build the colour a little. It is the perfect summer lip product too - something light and practical that is perfect for light natural summer make-up!!! wish the benebalm lasted longer on my lips. Overall, very moisturizing. This lip balm is an amazing solution for the problems many experience with Benetint - drying out lips. I already have dry lips, so it's a great addition. It's incredibly hydrating, with a lovely silky texture (not what you get with cheap chapsticks). It also has the amazing rosy scent of Benetint infused. However, the colour tint isn't very strong and doesn't really colour the lips, but I believe it's meant to be combined with benetint. It truly makes your lips look soft and kissable. Cutest design too - it looks so shiny and beautiful. I'm not a big lipstick person, but I do like a little bit of color on my lips. 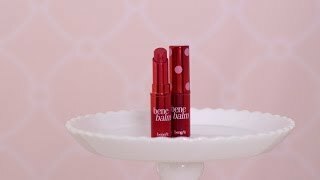 Benebalm gives me just the perfect amount of red to my lips, is super moisturizing, and smells like roses - literally! This is my favorite new product for day and night. Great alone or over other shades. Keeps lips hydrated and adds the perfect amount of flush. When worn over other colors, it seems to keep the color in place longer. An instant classic. I'll be getting one in every color! I love this hydrating lip balm! It looks extra fabulous when you layer benebalm over benetint (my favorite tint! ), it gives my lips a nice flush while hydrating at the same time, very convenient for girls on the go. I definitely recommend you try one of these balms and pair it with your favorite tint!